January 25, 2016 By This post may contain affiliate links. Do you celebrate the Chinese New Year? I hadn’t since I was a young child, but have very vivid memories of making paper lanterns with my classmates, learning to write some Chinese characters, and enjoying egg rolls and hot tea in my social studies class as we learned about the traditional celebration. 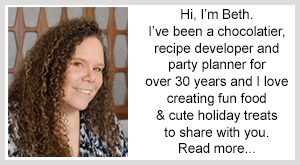 This year, I decided that since I’ve spent a few years creating fun food for holidays and special occasions to share with you here at Hungry Happenings, it was time to start adding a few new events to my calendar, so I hosted a Year of the Monkey party. 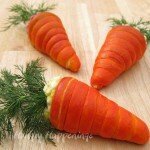 I had so much fun planning this event and creating festive food to serve to my guests. It felt a little bit like being back in school, as we gathered around the computer to do some research about Chinese New Year celebrations. My guests were all so fascinated with the Chinese Zodiac and had to determine under which sign they were born and what personality characteristics listed under their sign actually matched their own. The room was filled with roosters, horses, goats, and a snake. The only monkeys were on the food table. 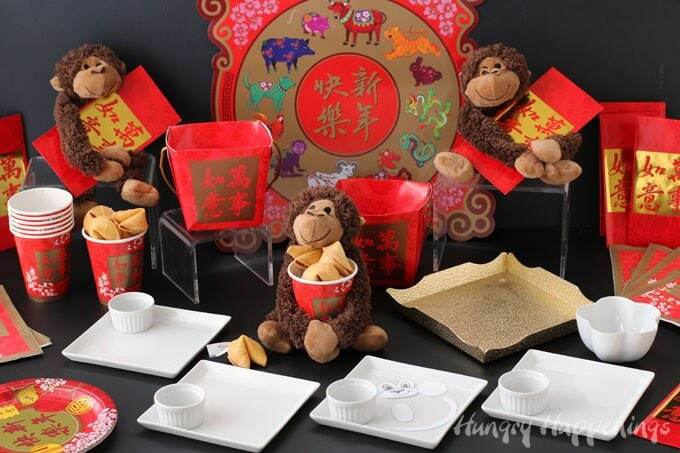 My set up included some traditional Chinese New Year party ware along with some stuffed monkeys which I arranged so they were holding cups filled with fortune cookies and red envelopes which are traditionally filled with money. The stuffed monkeys added a touch of whimsy to the ornate decor, as did the decorated food. 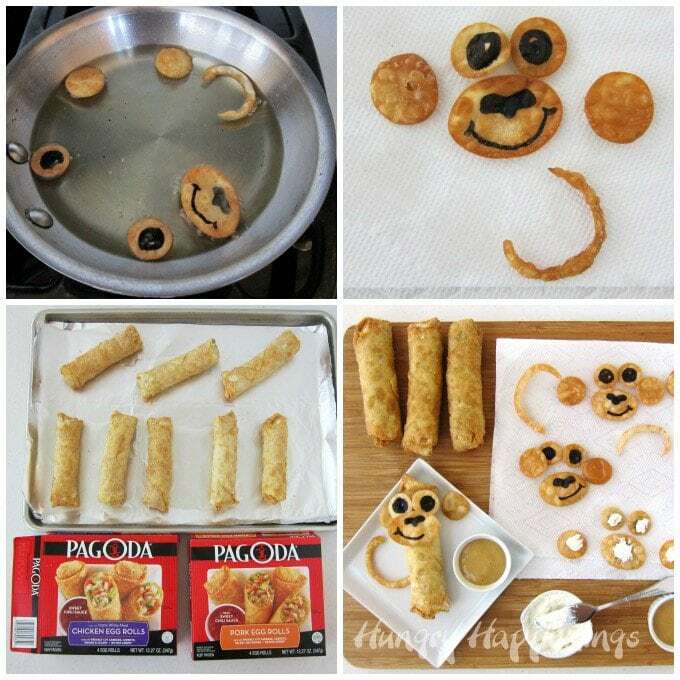 I decorated Pagoda Express Egg Rolls to look like monkeys and my friends thought they were one of the coolest things I’ve ever created for them. They are getting pretty used to seeing the sweet edible crafts I create, but to see an egg roll morphed into an animal really blew them away. 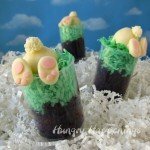 The egg roll monkeys definitely have the “wow” factor I like to create with my party food, but really were quite simple to make. I chose to use Pagoda Express Egg Rolls to make my monkeys because Pagoda uses really fresh ingredients including 100% white meat chicken and no MSG or artificial colors. 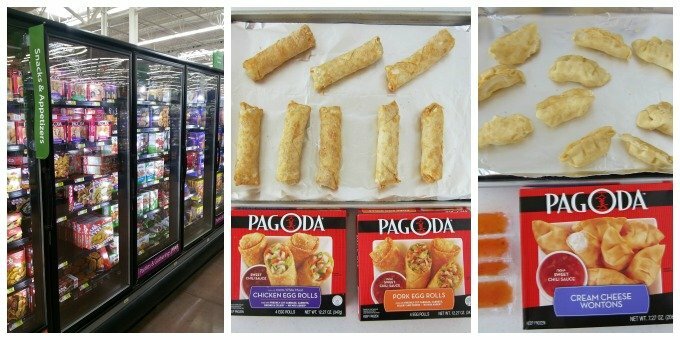 My local Walmart had a really great selection of Pagoda products including Chicken, Pork, Pork & Shrimp and Vegetable egg rolls. I grabbed some chicken and some pork egg rolls along with a box of Cream Cheese Wontons to serve to my party guests. You can find the Pagoda products in the freezer section at Walmart and for a limited time, you can use the Ibotta App to save $ .50 off the purchase two packages of Pagoda Express products. 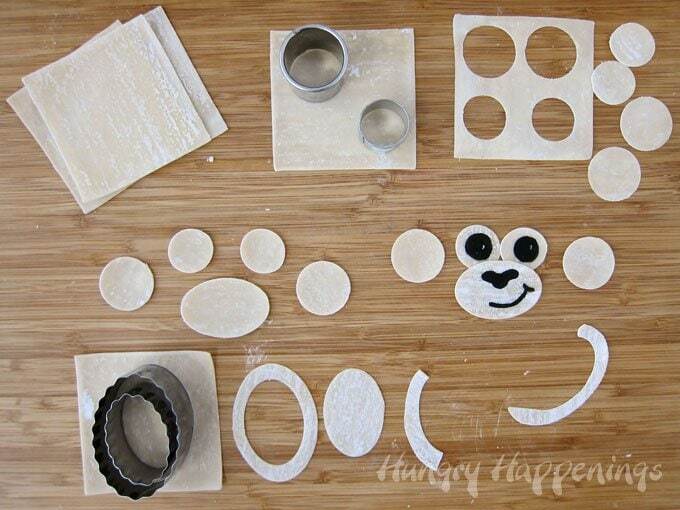 If you’d like to make your own egg roll monkeys, you will also need some won ton wrappers, the cookie cutters listed below and a black food coloring marker. To make the monkey’s features, cut two round eyes and two round ears out of a won ton wrapper. Draw pupils onto the eyes using a black food coloring marker. Cut a small oval for the snout and draw on a nose and mouth. To create the tail, set the larger oval cutter around the oval hole and cut. You’ll have a hollow oval. Cut that into a tail. These are pretty simple shapes, so if you don’t have the proper cutters, just hand cut them using kitchen shears. Heat a small amount of oil (about 3/4 cup) in a small pan until the oil reaches 350 degrees Fahrenheit. Place one set of the won ton pieces into the oil and allow them to brown on both sides. This will go very quickly. If the won tons begin to curl, hold them down, carefully, using a pair of long kitchen tongs. They flatten out easily if held flat against the bottom of the pan. Remove them once crisp and set them on a paper towel to drain off the excess oil. Prepare the egg rolls according to the package instructions. I chose to bake mine, but you can microwave or fry them. Once the egg rolls are ready to serve, spread some cream cheese on the back side of two eyes and attach near one end of an egg roll. Then attach a snout. 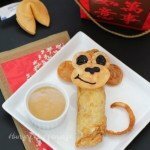 Set the egg roll on a plate and place two ears and a tail next to the egg roll to complete the monkey. In addition to the monkey egg rolls, I made a couple of firecrackers too. I simply cut some of the red envelopes to go around cardboard tubes from a roll of paper towels then slid the egg roll inside. I even made a wick and a spark using the left over red paper. What egg roll would be complete without some sauce to go along with it? I served the firecracker egg rolls with the spicy Sweet Chili Sauce that comes in the Pagoda Express package. To go along with the egg roll monkeys, I made some creamy sweet and sour sauce. Sweet and sour sauce blended with cream cheese. Stir together the brown sugar and cornstarch in a small saucepan. Pour in the pineapple juice, water, vinegar, and soy sauce. Heat over medium heat, stirring constantly until thickened, 1-2 minutes. Add cream cheese and puree in a blender or food processor until smooth. This sauce is smooth and creamy and pairs very nicely with the flavorful egg rolls. It is a light tan color which looks really nice in a little bowl set next to the Egg Roll Monkeys. If you were born in the Year of the Monkey (1920, 1932, 1944, 1956, 1968, 1980, 1992, 2004,) it is said you are witty, intelligent, and have a magnetic personality. You might be mischievous, curious, and clever. I tried to bring those traits out in my Egg Roll Monkeys too. What’s your Chinese Zodiac? 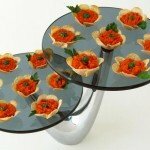 Have you ever celebrated with a Chinese New Year Party? I’d love to hear all about it in the comment section below. Thanks, Carrie. This party was so much fun to put together. It’s the first time I’ve hosted a Chinese New Year party, but it surely wont be the last. If I could come to your party, I would definitely celebrate the Chinese new year! Those little monkeys are so fun, I’d like to have some swing on by! If they could swing by, they would definitely hang around your house. They love a good party, and they know you put on the best parties ever! 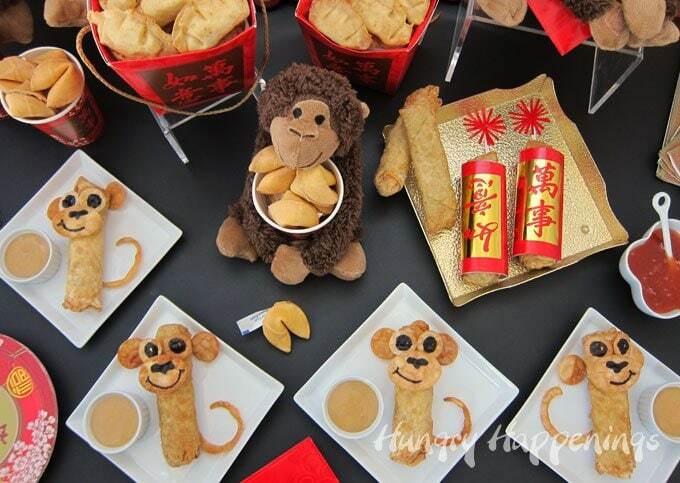 I think your egg roll monkeys are awesome as are all the parties you throw! 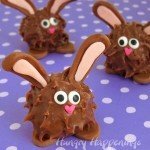 These look so yummy and so monkey cute! I was not born in the year of the monkey but it looks as though my Mom, daughter and grandson were. Maybe I better get to baking! Wow, you have a lot of monkeys in your family. 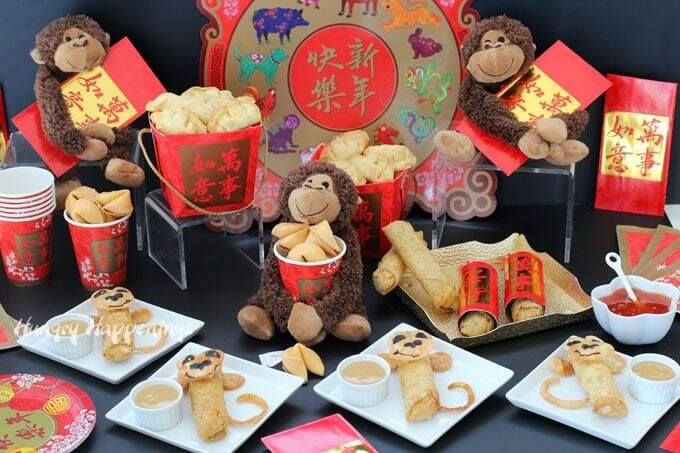 It might be the perfect year to throw a Chinese New Year party. My exchange student just had a baby this month, which is so perfect being monkeys have always been her favorite animal. One of the stuffed monkeys I used as decoration is heading over to Russia for the baby. Maybe it will bring her luck. I get that this was sponsored so maybe you didn’t have that much control over the content of this post, but this was a pretty lazy attempt at a “Chinese New Years” dinner. I’m sure you meant no harm and it’s always nice to see people interested in my culture. But to me, it looked more like you used an extremely meaningful, cultural holiday as a “fun” backdrop to sell frozen egg rolls produced by a non-Chinese company. Instead, it would have been nice if you hadn’t framed this as a CNY dinner. 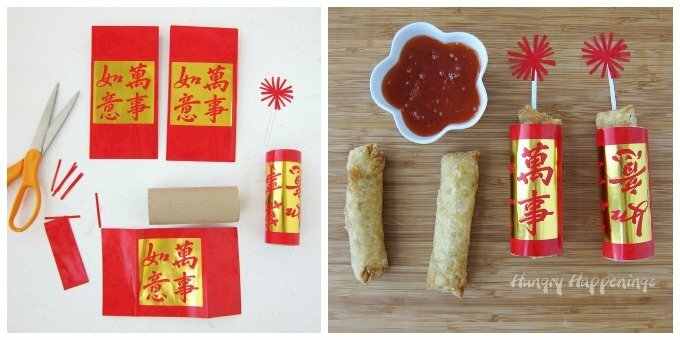 I’m sure there are tons of ways to decorate egg rolls without using Chinese culture as an accessory. Sorry if I offended in any way. 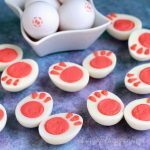 I hosted this party for my friends and shared this fun party food with them as a way to introduce this holiday to a group who knew nothing about the Chinese New Year. We actually spent time around the computer reading about the holiday together. My friends showed real interest in learning more. So, it was a very positive experience for everyone in attendance. You are right that this was a sponsored post for frozen egg rolls which indeed are an Americanized snack and I was asked to create a festive party to celebrate CNY. 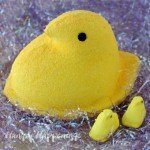 I did my best to use this party post as a tool to foster some interest in the holiday. As a fun food blogger, I turn ordinary food into food art and loved creating these egg roll monkeys which were meant to be served at party not a traditional CNY dinner.